Indeed there are. These are all the prequel trilogy references to my knowledge. Coruscant makes a brief appearance in Jyn's flashback, the signature skyline can be seen in the background. 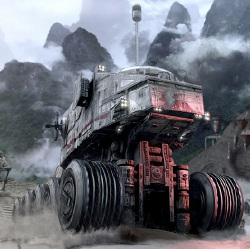 A Clone Turbo/Juggernaut tank (seen in Revenge of the Sith) is shown as Jyn's prisoner transport. Jimmy Smits and Genevieve O’Reilly both reprise their prequel roles as Bail Organa and Mon Mothma respectively. Bail Organa mentions the Clone Wars, which was briefly mentioned in Ep. 4, and unfolded from Ep. 2 to 3. Saw Gerrera, while not necessarily a Prequel Trilogy character, is a prequel trilogy era character created by George Lucas who made his debut in The Clone Wars animated series. Where is Vader's fortress located? What is the time span of the Prequel Trilogy and Original Trilogy? Was there a Wilhelm Scream in Rogue One?